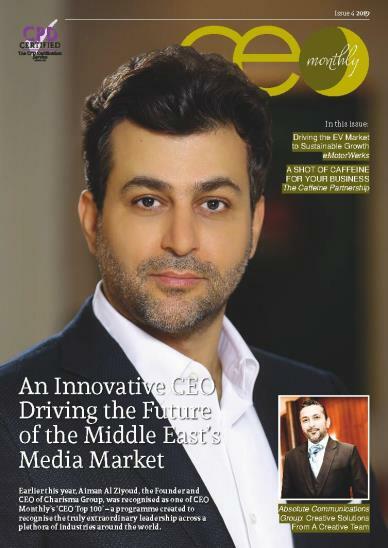 Welcome to the fourth issue of CEO Monthly for 2019. Every month we endeavour to provide our readers with the latest news and updates from all corners of the business world. This issue’s theme is communication. Whether it be through media or marketing, communication is key to the day to day operations of the business world. It is both essential for growth – reaching out into new markets – and to nurture existing audiences, creating long-lasting client relationships. This month, we showcase a few of communication’s champions. Aiman Al Ziyoud founded the Charisma Group to reflect the changing needs of consumers in the media market. Al Ziyoud believes, fundamentally, that television needs to evolve to remain relevant: to change, adapt and improve in line with the digital revolution. Named among CEO Monthly’s ‘CEO Top 100’, we spoke to Al Ziyoud to find out more about Charisma Group and their work. Founded by Victor King, Absolute Communications Group is an integrated communication agency that is based in Dubai. Specialising in PR, social media, creative design and visual communications, they have swiftly made an impression as a sort of ‘one-stop-shop’ for their clients, experts in all areas of modern marketing services. We take a close look to find out how this versatile firm is revolutionising their industry. Finally, the team here at CEO Monthly hope you enjoy this month’s issue and we look forward to hearing from you soon.